Can you tell how these cookies took half the time to dry than usual? If you haven’t figured it out, maybe a hint… It has something to do with the fact that the daisy petals are able to ‘hang over’ the edges of the base. 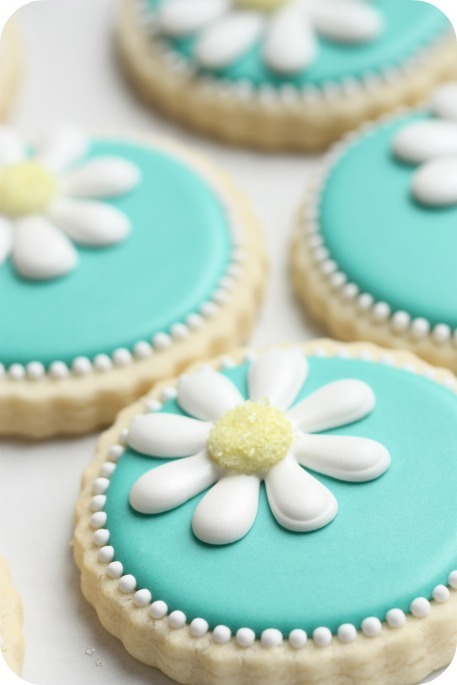 The daisies are royal icing transfers. 🙂 (I’ll show you how I made them in the video below). 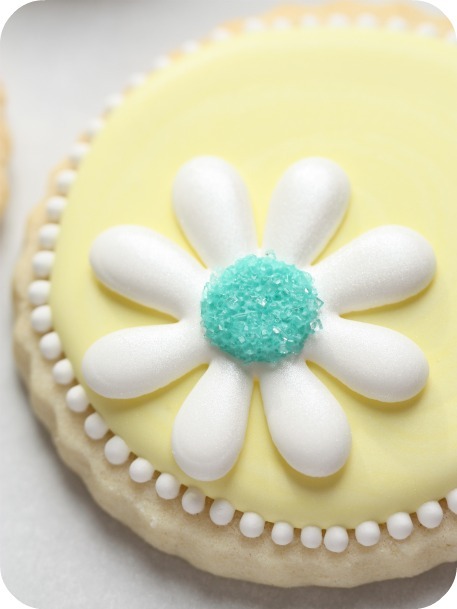 Instead of having to pipe the design on my base and then wait to let that dry, I was able to pipe both the teal base and the daisies, let them dry, and in 24 hours, adhered the daisy to the cookie. Voila! (The things that make me happy. Lol). If you’d like to see how these were made, including a few tips about decorating with the Kopykake projector , click on the video below. A note in here for those of you who read my photography tips post; I orgininally made the collage below first and then decided to put all the steps in one, so made the collage above… and forgot to fix the lighting… can you see the difference? After I made the video, I decided to spray the cookies with PME pearl lustre spray for a little sheen. 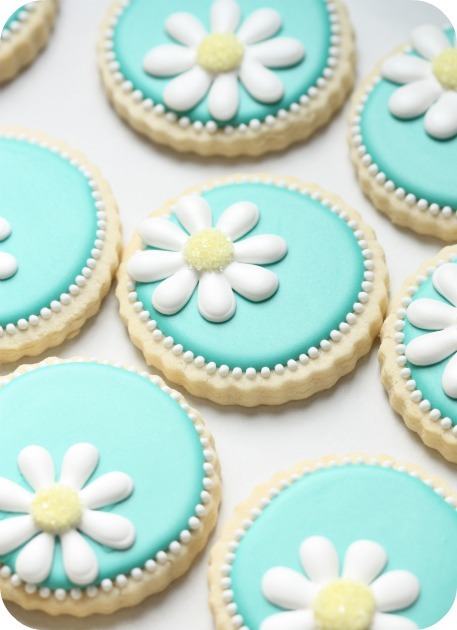 If you’d like a more detailed pictorial how-to on making royal icing transfers, click here. These cookies might work well as ‘name-tag’ favours if you added the names to the open space. 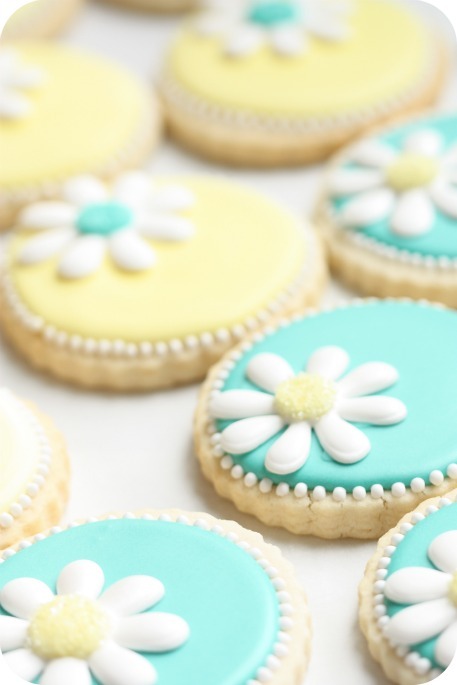 Thanks to Kim of The TomKat Studio and HGTV for including these cookies in their Yellow & Blue Easter Brunch! I’m working on a thorough Kopykake Projector Tutorial Video. Coming… soon? For now, for those of you interested, here’s a post on it (click here). 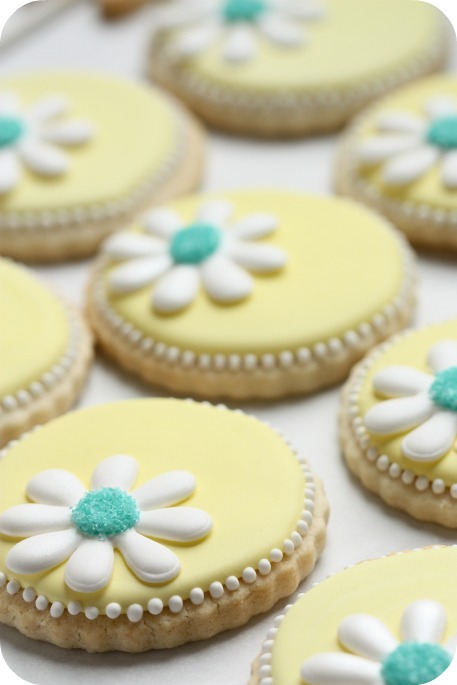 The KopyKake projector isn’t needed to make these cookies; you could just trace the daisy instead of projecting the image. I like the projector because 1) it’s faster for me to just pop the image in and project and 2) more importantly, if I’m making a more detailed image like the owl cookies in this post here, I’m able to see the second layer (owl’s eyes and belly), whereas if I were tracing I’d only be able to trace the first layer (brown body). 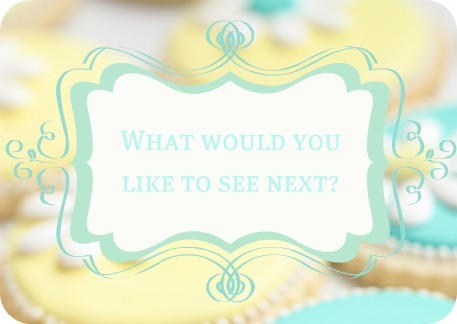 What would you like to see in the next video? Drop me a line in the comment section below, on YouTube, or my facebook page here. And in case I’m not able to post again before then; Happy Easter to you! I just looove ur cookies! Wanna bake and decorate them all! 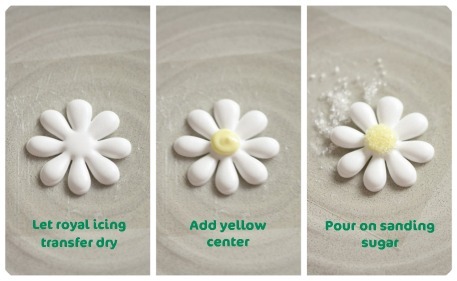 Will definitely try to make these daisy transfers! Cheers from mx! Thank you for all of your tutorials!! Could you tell me where you got the daisies that you used for tracing? @ Mary Ellen: Walmart. They’re in the video if you want to see them. Your cookies are absolutely AMAZING!! I am on your website literally everyday. I just can’t get enough of your information and tips. Thank you for taking the time to help others! What size cookie cutter did you use on these cookies? That helps perfectly! Thank you so much for responding! Hi Marian! 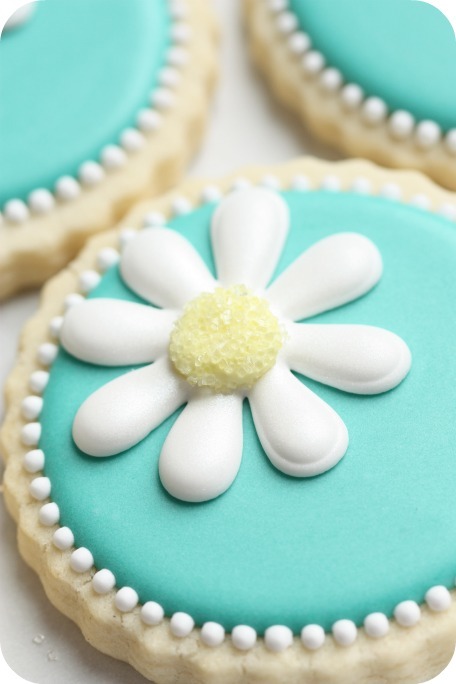 I *love* these cookies and plan to draw from your design for cookies for my baby shower 🙂 Quick question, is that Americolor Lemon Yellow? Egg yellow? Thanks in advance for your help and your inspiration! @ Michelle @ MakeMeCake.Me: Lemon yellow. Have fun! Beautiful cookies. Thanks for the video. Hi Marian! 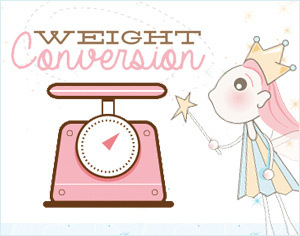 I love your blog, soooo inspiring! I wanted to ask you if you know another method besides a fan to speed up the drying of RI transfers. Have you tried putting them in the freezer for a couple of hours? I’m afraid to mess them up. Thanks! HI @ Agatha: I haven’t tried it, but I remember reading somewhere in my comment sections that Julia Usher uses a food dehydrator. It sounds like an intriguing, good idea! Let me know if you give it a shot. I love your site I could just spend hours reading everything and looking at all the pictures. Now that it’s spring well kind of. Would you be able to do spring cookies butterflys, ladybugs, dragonflys, with your marble technique. I know you’ve done butterflys but I would love to see spring colors. Or somemore cookies done like the sheep and Christmas cookies with the buttercream. Or just be your creative self it all seems to be just beautiful. Thanks for sharing all your ideas. Thank you: Just do what you do best, whenever you can. Just looking forward to anything you do. 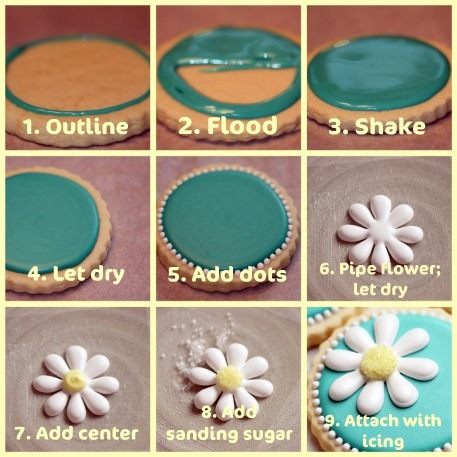 I have just started playing around with cookie decorating and I stumbled upon your blog. I have learned so many great tips and I am obsessed with watching and learning as much as I can from you! You’re a great teacher and thanks for sharing your talent! Awww, thanks, @ Erin! Have fun playing around and learning! Love these. Simple and so beautiful! Can you re use the transparency sheets, or do you toss it? Absolutely, you can re-use the transparency sheets – just wash with dish soap and warm water and make sure it’s completely dry before you prepare it for the next batch. Wonderful video 🙂 I will have to try the transfer sometime soon, it looks like a lot of fun! Thanks Sherie and Rada! Have fun decorating! Thanks for your info. Just starting. Cookies came out great. Will try icing today. Will let you know. Thanks for all the info! I would like to know how is the consistency of the oral cing? It’s a 10 second icing – There is a video on my YouTube channel which shows it. Hi, if we don’t have the transparency sheets can we substitute with anything else?